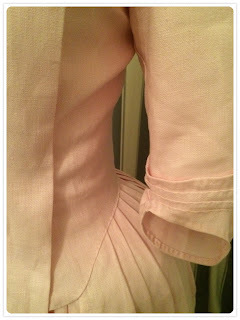 Hi, I'm Eloise and welcome to my blog recording my discoveries in historical sewing. I have sewn for over 30 years for myself and my children, with varying levels of success. The gorgeous textiles of historical literature and film have always captured my imagination, and in 2017 I decided to dive in and educate myself both in the history of fashion, as well as in the finer aspects of sewing, mostly by hand. I hope you find some enjoyment in reading the details of this education! I would like to say, hand on heart, God bless Larkin and Smith. Whoever you are and wherever you live in this world, may the sun shine on you and may you see your grandchildren's grandchildren. 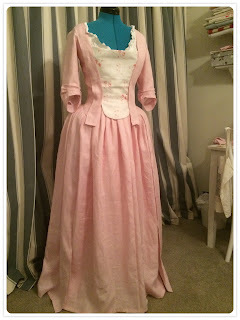 I had decided to base the first dress pattern I made roughly mid-18th century. 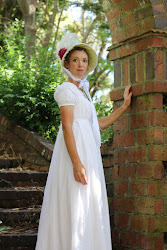 The gown pattern I landed on was the 18th Century English Gown, a 1760 - 1770s open front gown with a stomacher. 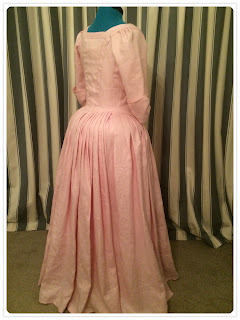 I was a little scared of the French style of gown with it's saque back, and I loved the look of the back in the enfourreau style. I first checked out how much fabric I would need. It seemed a huge amount at the time - about 7 metres from memory! I actually ended up with about 2 metres left over, while still doing all the recommended fullness, so I guess it was because it was a plain fabric and no need to match patterns? 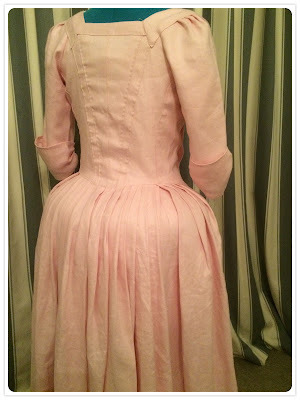 The fabric I chose was a medium weight pink linen. It is the lovely dusky pink colour that I am extremely partial to right now. I'd no idea if women of my class (middling classed wife of a shop owner!) would wear pink or linen. I think that possibly no-one over the lower class actually wore linen outer-wear, and especially not in the open fronted robe style. Pink was probably less inaccurate than the fabric. But for now, linen seemed nice and authentic, and I wasn't that keen on forking out for 7 metres on a $50/m silk and upwards, on a whim. What if I made an absolute stuff up of it?! I also bought coarse pink cotton thread as the local Big Box fabric store had no linen. I started with the mock-up. 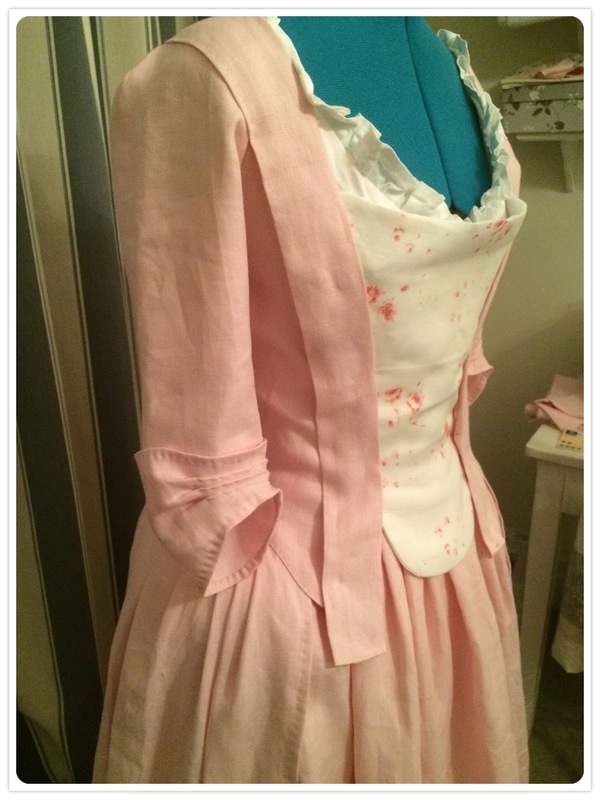 As before, I took the size 34 and added 4cm to the length of the bodice front and back. There was two pages, and seven steps and relevant full-colour photos to help with this process. 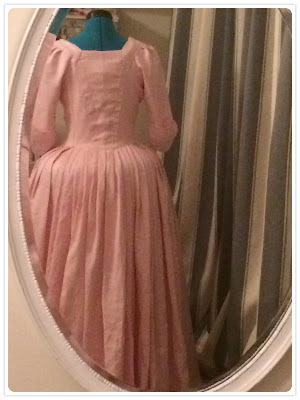 As I don't know exactly what they ought to fit like at this stage, in terms of creating the correct posture, it is still somewhat trial and error as I have never actually worn a true 18th century costume! Cutting and pleating the back panels was easy and extremely rewarding. I had never actually hand-sewn before, and it was very interesting to read that historically there wasn't the stigma of having to hide the stitches from the outside. The stitching became something of a feature and a place to show off your abilities (or that of your seamstress anyway!). 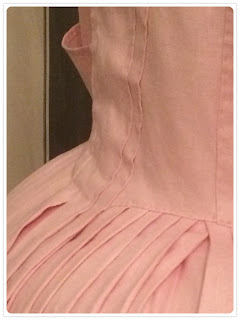 I loved the pleating template that they included, as it made it so easy to get the accurate width and curve to the pleats. The pattern uses the technique of sewing the lining to finished pieces and then to each other, rather than completing the entire outside fabric and the entire lining and then sewing them together. This is new to me, but makes it possibly to ensure all the pieces are lined up and the correct size with no horrible realisation when inserting the lining that you have cut it in the wrong size! Neck facing were something of a tricky step, and it seems common to have a slightly un-symmetrical back neck facing on many original gowns. This makes me feel better! I still tried my best to have corners matching but didn't quite make the mark in many places. 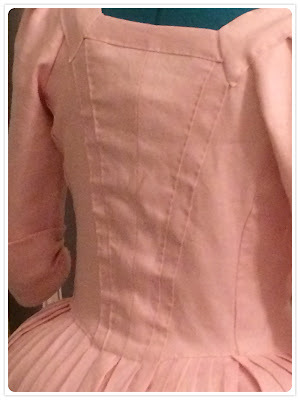 The stomacher was a slight failure, as for some strange reason I omitted to lengthen it as I had the bodice pieces. The pattern also calls for it to be un-boned, which is all well and good when pinned to one's stays. However I was completely new to this and the idea of pinning oneself into ones clothing was terrifying! In the end, I tried on the gown and marked the edges of the robings, and then sewed hooks and eyes to hold the stomacher inside the gown. This I will definitely change at a later date, but for now it felt a little less scary. I also sewed the robbing completely down the front opening. This is probably going to be a problem if I ever wear the dress, as it means the robbing need to be folded back open if pinning and then folded back over the pins. 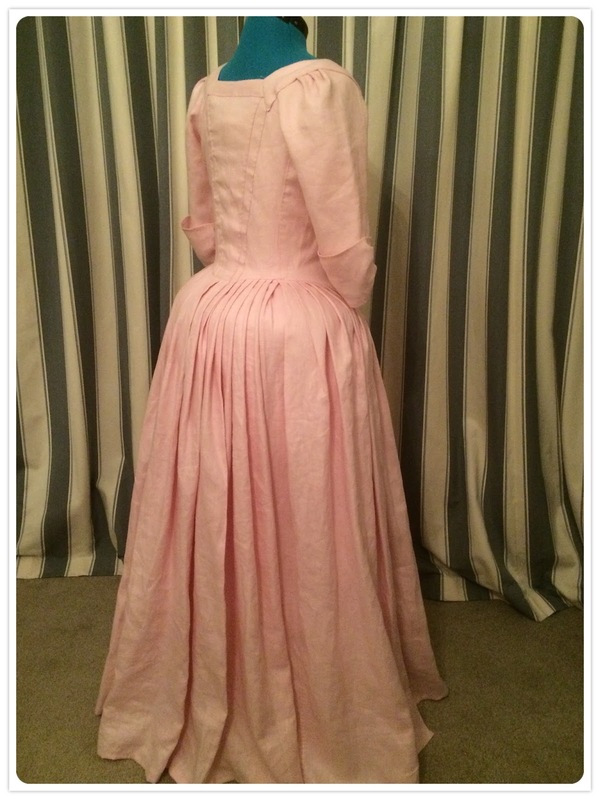 However I think some gowns had robings sewn to them, so maybe it's not entirely inaccurate! To get the correct silhouette I needed a bumroll. Either that or panniers, but that seemed much more casual and easy. A couple of attempts later, below is the resulting silhouette. It was made of a banana-shaped tube of some left-over fabric, lots of poly-fill from some old cushions, and two pieces of cotton tape. Bob's your uncle. Finally I made the petticoat in the same fabric, knife pleating to the suggested width of 1" each. I made a self band to tie front and back with the traditional pocket openings of 10" on each side. At this point I think I decided that I was just going to interchange imperial and metric measurements and this is what you get! Below are the dummy photos. Unfortunately the dressmakers dummy is too large for the dress dimensions, so I will later post a photo shoot by my lovely daughter, wearing it myself. Worn over my first unsuccessful shift attempt.